The commission said the election, pitting transitional President Joseph Kabila against former rebel leader Jean-Pierre Bemba passed normally throughout the vast mineral-rich Congo. 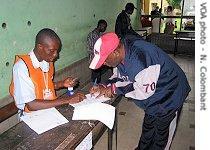 It congratulated voters for going to the polls, despite heavy rains in much of the country's west. An election for new provincial assemblies also took place, even though some of the ballot papers for that election were sent to the wrong places. The commission pointed out two serious incidents of violence, one near the town of Bumba, where election officials were accused of stuffing ballots in favor of Mr. Kabila. The commission also mentioned an incident in Bikoro, where it said unidentified gunmen attacked two polling stations. Officials said there was also an attack on a pro-Kabila radio station in the same province. Media reports quoted police and officials as saying at least one person was killed in violence. Meanwhile in Kinshasa, officials delegated by the two presidential candidates signed an agreement guaranteeing security for the election loser. They also called for their supporters to remain calm and to use only legal means in case of a dispute. Following a sometimes chaotic and confused release of first round results, clashes between rival armed groups left dozens dead last August in the streets of Kinshasa . A spokesman for Congo's U.N. peacekeeping mission, Jean Tobie Okala, says efforts are being made to avoid a repeat scenario. "The electoral commission organized workshops after the first polls, just to learn lessons from the first round, what happened, what was not good or wrong, why did that happen," he said. "And, they say that having learned lessons from the first round, they will do better than during the first round." he Africa director for a U.S. based pro-democracy group called IFES, Chris Hennemeyer, says the problems may be deeper rooted. "There was a fair bit of trouble when the results were announced in August, but, of course, that trouble was largely limited to a few square blocks of downtown Kinshasa, and the rest of the country was relatively unaffected," he said. "The question mark in all this is these individual militias that the candidates have, and that is a problem that has yet to be fully resolved. I think, in the longer term, stability of the Congo is going to depend upon successfully integrating these armed men into a national army, and giving it some kind of national focus, as opposed to its current regional, political and ethnic affiliation." Observers, journalists and diplomats said turnout in certain parts of the country appeared much lower compared to the first round. In the eastern region of Ituri, human rights observers reported that soldiers set up roadblocks on access roads to polling centers, asking money for passage, and thus further reducing turnout. Final results are not expected until mid- to late November, but security will be heightened in the coming days, as candidates should be able to figure out through party delegates who the winner is. Mr. Kabila nearly won outright in the first round, and built alliances going into the second round, making him the favorite. He has been president since 2001 after his father, a former coup leader, was assassinated.